NovAge Ecollagen Wrinkle Power reveals a beautifully smooth, radiant, healthy-looking complexion. It is designed to help boost collagen to correct wrinkles over time, boosts hydration to plump and smoothe them instantly, and protects the skin against aggressors to help slow the skin-ageing process. Powered by patented Tri-Peptide Technology, Low Molecular Weight Hyaluronic Acid and Edelweiss Plant Stem Cell extract. Clinically and consumer tested for efficacy. ∆1 Clinically proven instant measurement of wrinkle volume, using the NovAge Ecollagen Wrinkle Power Set. 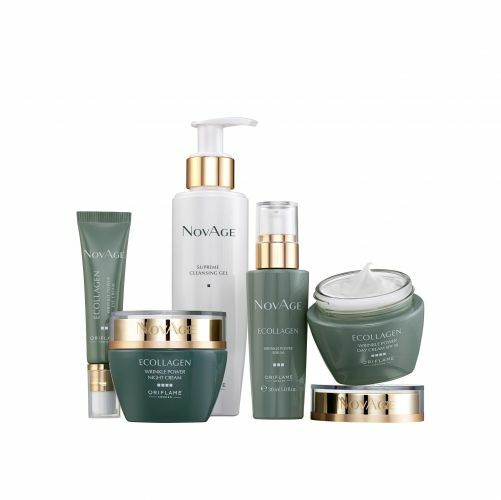 The 4-step NovAge skin care routine is your daily foundation for youthful, healthy-looking skin at any age. It's scientifically designed, with scientifically proven results. All you have to do is follow the routine twice a day, every day - and enjoy the difference it makes. Cleansing your skin morning and evening removes impurities for good skin health and creates perfect conditions to absorb the rest of the products in your routine. Dispense one pump of cleansing gel into the palm of your wet hand. Massage gently but thoroughly into the damp skin with your fingertips, avoiding the eye area. Pat the skin gently dry with a soft towel. Eye creams have lighter textures, are fragrance free, and specially formulated to target the unique needs of the eye area like lines, puffiness and dark circles. Dispense a small bead of cream for each eye. Dot the cream along your orbital bone with the tip of your ring finger. Avoid direct contact with the eyes. Pat gently into the skin until absorbed. Serums are the booster of your routine. The fluid texture of serum is designed to deliver its hydrating and youth-preserving actives quickly and efficiently, before you apply your day or night cream. Dispense one pump of serum onto the back of your hand. Pick up product on your fingertips and dot lightly and evenly over your face, avoiding the eye area. Tap into your skin or sweep gently all over your face until absorbed. Day and night creams provide the final layer of active ingredients together with moisturisation. The day cream is designed to help hydrate and protect your skin, while the night cream is designed to restore and replenish while you sleep. Apply just 5 pea-sized dots of cream - on your forehead, each cheek, your nose and chin. Use your fingertips to gently pat or lightly massage the cream evenly all over your face, avoiding the eye area, until it is fully absorbed. ∆∆ Clinically proven results using full skincare routine versus either untreated skin or simple routine for NovAge True Perfection, Time Restore, Ecollagen, Ecollagen Wrinkle Power and Ultimate Lift. This best-in-class, patented wrinkle technology combines peptides from rice, wheat and yeast. Tri-Peptide Technology boosts collagen more powerfully than the three individual peptides. Low Molecular Weight Hyaluronic Acid attracts and retains up to 1000x its weight in moisture. 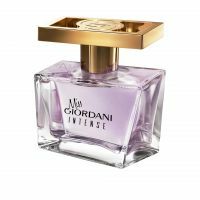 It can be more effectively absorbed into the skin where it smoothes out wrinkles and enhances the skin's overall look and feel. This Plant Stem Cell extract was selected for its ability to guard both collagen and hyaluronic acid against degradation. It helps to support the action of the Tri-Peptide Technology and Low Molecular Weight Hyaluronic Acid to help slow the ageing process. Cleansing Blend: A balanced blend of mild surfactants, which effectively remove visible impurities including dust, dirt, pollution particles, make-up and excess oil and sebum, to be rinsed clean away with water. Moisturising Blend: A blend of hydrating and conditioning ingredients designed to leave the skin feeling soft, supple and comfortable. Soothing Technology: Skin-soothing technology with natural origin Bisabolol, which is a constituent of Chamomile and the Candeia tree. Vitamin E: Vitamin E is known for its exceptional skin moisturising and antioxidant properties. Caffeine: One of the best-known active ingredients in eye creams for good reason, Caffeine is popular for its stimulating properties, helping to diminish the appearance of dark circles and puffiness, which manifest as a result of slow microcirculation and are made more visible by the thin skin beneath the eye. Conditioning Complex: A complex of humectants and moisturisers specially blended to hydrate, nourish and protect the delicate skin of the eye area. Optical Pearl Technology: This blend of miniscule mineral particles act like prisms, capturing and reflecting light across the skin's surface to help blur and perfect texture and tone, without masking its natural beauty. Pre-Biotic Active: Pre-Biotic Active is an extract from a marine microorganism found in Northern France, in a special ecosystem where fresh water meets sea water. This innovative ingredient serves as 'food' for the good bacteria found on the skin. It stimulates cellular renewal and promotes good skin health. Hydration Complex: A special blend of moisturisers clinically proven to provide all day hydration. SPF 30 and UVA protection: UV protection is the best defence against skin ageing. 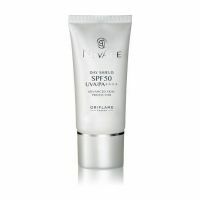 Provides SPF 30 protection and UVA protection. Pollution Protect Technology: This modern technology is designed to protect the skin against the negative impact of environmental aggressors like pollution. It forms an invisible, breathable film, which helps harmful pollution particles from coming into contact with the skin barrier. InstaSmooth Technology: This ingredient offers instant filler-like benefits, selected to supplement the longer-term wrinkle correction provided by the collagen-boosting Tri-Peptide, for an instantly refined complexion. Niacinamide: Niacinamide (Vitamin B3) is an extremely powerful and effective skin restorer with multiple documented benefits including boosting cellular energy, and promoting a strong and balanced skin barrier. Vitamin E: This renowned antioxidant plays a key role in protection against skin-ageing free radicals, and is also associated with skin hydration. Shea Butter: Extracted from the nut of the African tree of the same name, Shea Butter is a wonderful skin replenisher, soothing and relieving dryness to leave the skin beautifully soft and supple. 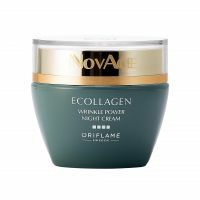 NovAge Ecollagen Wrinkle Power instantly smoothes wrinkles by up to 49%, and boosts collagen to correct wrinkles over time - clinically proven!